(it’s part of #freefoodfebruary if you’re a Twitterer). In the past I’ve tied myself in knots wondering what to make for these mornings in group (mostly because I’ve been a little paranoid about appearing like a ‘can’t cook man’ in a room full of ‘can cook ladies’) but this time around I’ve eventually come to the conclusion that sometimes simpler (and cheaper) is a better option. Originally though I thought I’d try to be clever and do a twist on sushi by making little chilli con carne rice rolls (I make a great chilli even if I do say so myself). I’d never made sushi before though – but how hard could it be? It turns out if you’re doing it from scratch it’s a REAL faff. You need a sushi rolling mat (which I bought for £3.50), toasted seaweed strips (found these for £1.50), but most importantly you need the right rice for the job. I didn’t expect that to be an issue – and after a bit of a hunt in several supermarkets I did manage to find it locally – but only in massive bags. The cheapest of these was an eye watering £15 – and that was before I’d even made the chilli, so my arty farty idea bit the dust then and there. Instead I thought I’d go for a staple fallback of mine (which is something I ripped off from our group leader Angie in the summer) and make mini quiches. Since they cook on a lower heat in the oven than the other item I was planning to do as well I decided to cook a batch last night before I went to bed and serve them cold. I think they actually look really nice after a night in a cool storage box! I won’t give the recipe again – it’s here in an old blog, although this time – due to a UK courgette shortage after flooding in Spain I’ve only used (lots of) broccoli, onion and mushroom as the vegetable elements of the filling. The blog picture in the link above looks strangely orange – but my one is a lot darker. I cant see how this wouldn’t be the case as the Worcestershire sauce changes the colour of the salsa considerably when you add it. Last night I wasn’t sure about the taste of this after simmering for the required time – but this morning it tastes really nice! 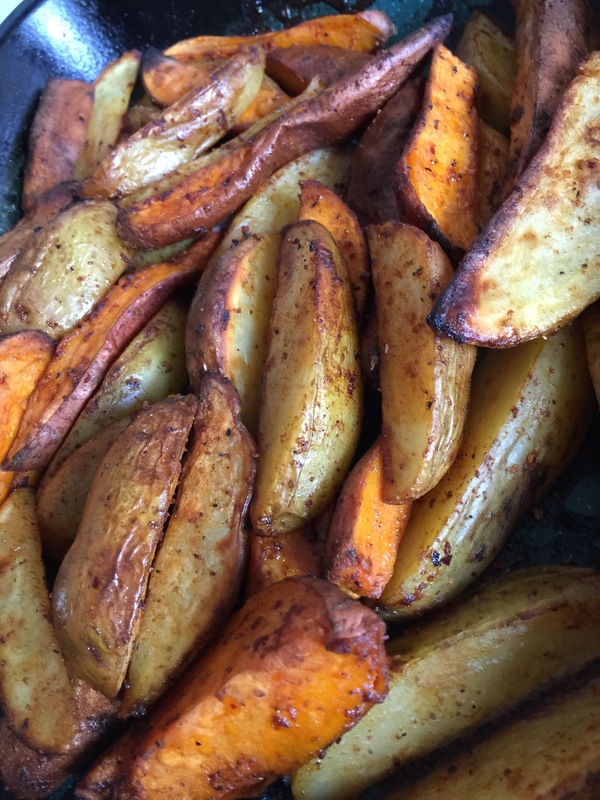 So – this morning (they’re cooking now and smell awesome) I’ve been making potato and sweet potato paprika wedges. These are dead simple to prepare. Space out the wedges and spray again with spray oil. Put in the oven for 45-50 minutes at 200ºC/400ºF/gas 6 for around 40-45 mins (my oven isn’t fan assisted so you may need less). One member made a kind of bread pudding from weetabix – which although not strictly a free food due to the raisins was undeniably awesome! Most people seemed to have had a trouble free cooking experience but I did feel sorry for the poor (but indomitably cheery) person who made a slow cooker full of butternut squash soup. As nice as it was half of it had tipped out of the slow cooker in her car on the way to the meeting and there wasn’t much left in the bowl. I can only imagine the horror of getting that out of her upholstery!!! I hope she’s a whizz with a sponge! For my part – although my nibbles went down well I didn’t have such a great result on the scales. 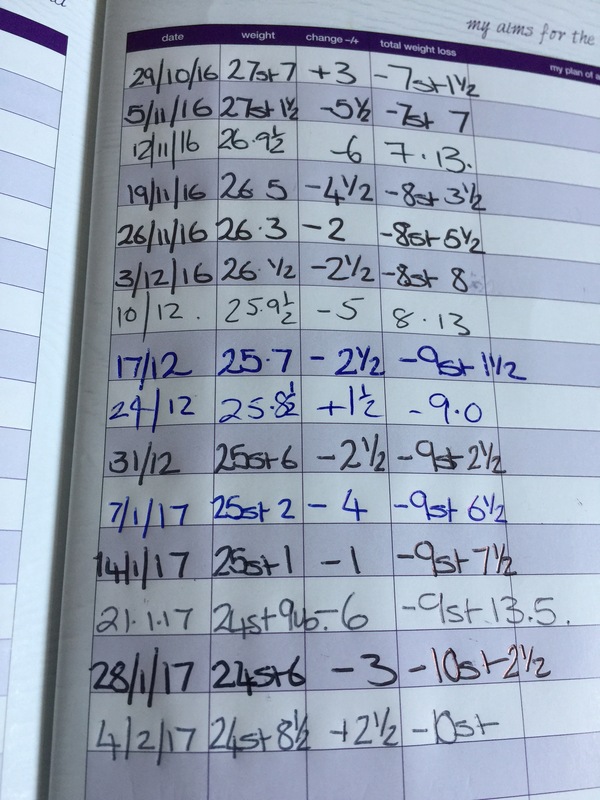 Although I held on to my ten stone loss, for some reason I put two and a half pounds back on this week. It’s a bit unfair as I spent the whole week walking and exercising only to have something of an anger related blow out evening last night where I probably ate two and a half pounds of chilli con carne, and then had a big bowl of fruit and yogurt afterwards. In truth I’d have probably maintained this week if it wasn’t for that but honestly I’m not particularly upset about it. Although I would definitely prefer that it hadn’t happened it’s nothing that hasn’t occurred before – and I’ve always pulled it back the next week. This time will be no different. I refuse to add it to the list of things I’ve been needlessly worrying about over the last few days. Today is going to be a good mood day! As is now usual my remedy to the blues has been exercise, and along with my brother I’ve just had a brisk walk into town for a coffee after I nipped home to drop off my Tupperware. I’m not sure what the rest of the day holds but according to Apple Watch I need to make sure it contains another 14 minutes of cardio – which should hopefully be catered for by a brisk walk home. After that I think I’m going to watch a film of some kind and chill out for the rest of the day. I hope you can forgive me Internet but I’m going to tidy the kitchen and do the washing up tomorrow!!! Onwards my friend!! A mere false flat, next week will see you right. I agree with Mar & Bob (I realize I’m reading backwards here), I also want to say the food looks absolutely amazing! *drools* I may be making those wedges this evening for dinner. You are brave for considering making sushi, I’ve seen a ton of recipes that make it seem all super simple, but it’s so Not! I am sure that you are going to rock it this Lettuce week. The salsa was absolutely ace – however it’s worth leaving it overnight, so make it in advance. The taste was a million times better a day after it was made and refrigerated.